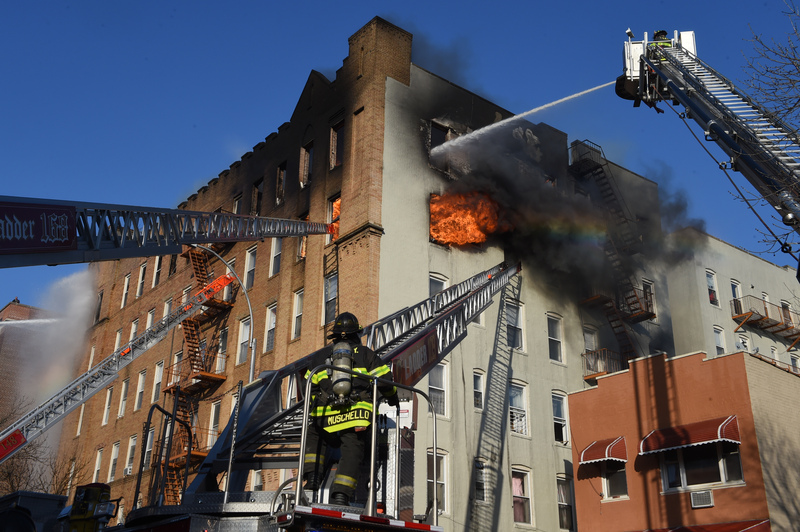 SUNSET PARK – Over 100 Brooklynites were displaced from their Sunset Park home at 702 44th Street after a six-alarm fire ripped through their building yesterday evening. The displaced residents were given vouchers to local hotels, for one night. The MTA provided a bus, which transported residents to the hotels. Council Member Carlos Menchaca spent most of this morning at the Sunset Park Recreation Center, where various city organizations and the American Red Cross created a reception center to answer questions and assist Brooklynites. According to Menchaca’s office, the council member was assisting displaced residents at the Center today by signing them up for emergency housing assistance. Once residents sign up, they will have long term housing. To help those in need, a GoFundMe page has been set up by the Sunset Park Business Improvement District. Currently, they have raised over $5,000. They are aiming for $100,000. You can donate here. “In the typical Sunset Park spirit of community and generosity that so many people have experienced in our beloved neighborhood, we are coming together to raise funds for our neighbors so they can rebuild and focus on the wellbeing of themselves and their families,” the page states. For those wanting to donate clothing and hygienic goods, they can be dropped off to the Salvation Army at 520 50th Street off Fifth Avenue.